I've had the pleasure of being a guest blogger on a couple sites this week. I invite you to check out "Keep The Good Going: The Choice Is Yours" on the NAMI Mass blog. NAMI is the National Alliance on Mental Illness and I spoke at the Massachusetts convention last October. The other blog post is at EssenceCoaches.com, a new group of energy coaches I'm part of. I'm a featured coach this week and wrote a short piece on Transformation. I was also interviewed along with two other coaches on the Meet The Coaches Blog Talk Radio program Monday night. Check out my bio page to learn more about essence energy work. Both posts were greatly influenced by the Certificate in Positive Psychology program I'm currently taking. It is being taught by professor and author, Tal Ben-Shahar and has been outstanding so far. Earlier this month I spent an immersion week at Kripalu Center for Yoga and Health in the Berkshires of Western Mass as part of the program. It was an amazing week of lectures, exercises, new friends and many things I don't normally do, like yoga every morning and dance yoga with a hundred people. It made for quite a strange transition going from Kripalu to working on Cheerleaders vs. Redneck Zombies! I've visited Kriplau a couple times before for Holotropic Breathwork, but had never been there for a full week or had time to explore their many offerings. This time I tried Cranial Sacral Therapy, Reflexology and Neuromuscular Therapy. Cranial Sacral was not at all what I expected! I thought it was some sort of head massage but it was a full-body, slow-motion wrestling sort of thing. I was twisted into all sorts of shapes and positions that I was surprised I could be in, yet I was so calm and relaxed I could have fallen asleep. And it definitely put me in altered state - swear I was seeing sound waves at dinner after my session, and it felt like I was on a major delay from someone asking me a question and me having any clue that I should respond. Very, very trippy. My altered state only lasted for an hour or so (I think) and I will definitely try this again. I've heard of Reflexology for many years but this was my first experience with it. It was quite cool and relaxing. Nothing near as trippy as Cranial Sacral. It was wild to have so many sensations in my feet which I thought had two options; ticklish and numb. Bizarre to have my lip twitch or an arm jolt due to touching one point on a foot. Neuromuscular Therapy, which is the most painful thing I've ever experienced, was much more than a traditional massage. I was so close to screaming STOP! Great practice for going to my happy place and breathing into pain. Whoever created this must be a big fan of banging his head against the wall because it feels good when you stop. I get to do it all again in April when we have another immersion week. Already looking forward to it. It has been a banner time for my extra work, or background performances as snotty people might say. This year I've been in scenes with Tom Hanks, Sandra Bullock, Kate Winslet, Josh Brolin, and Steve Carell to name but a few. Three cheers for being blurry bits in the background! 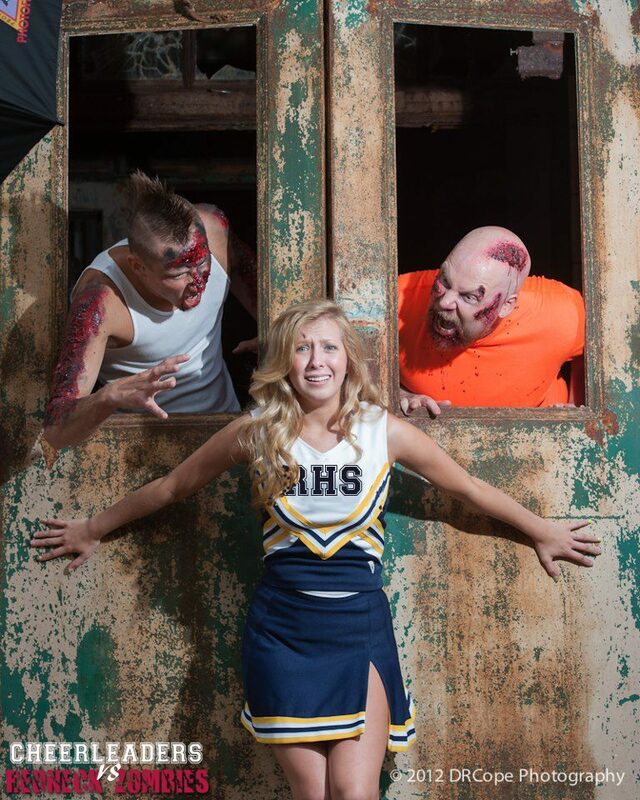 Zombies and Cheerleaders in a gentler time. 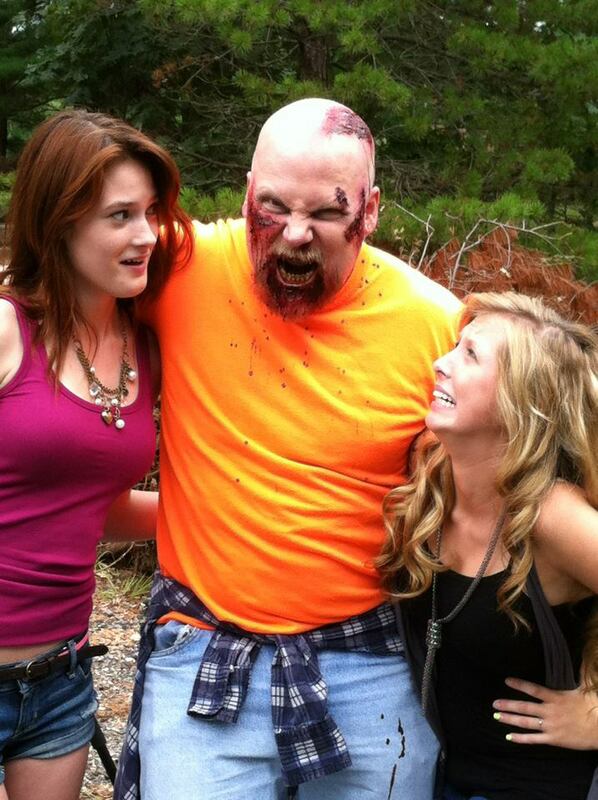 For the second time in my illustrious career I get to play a zombie. 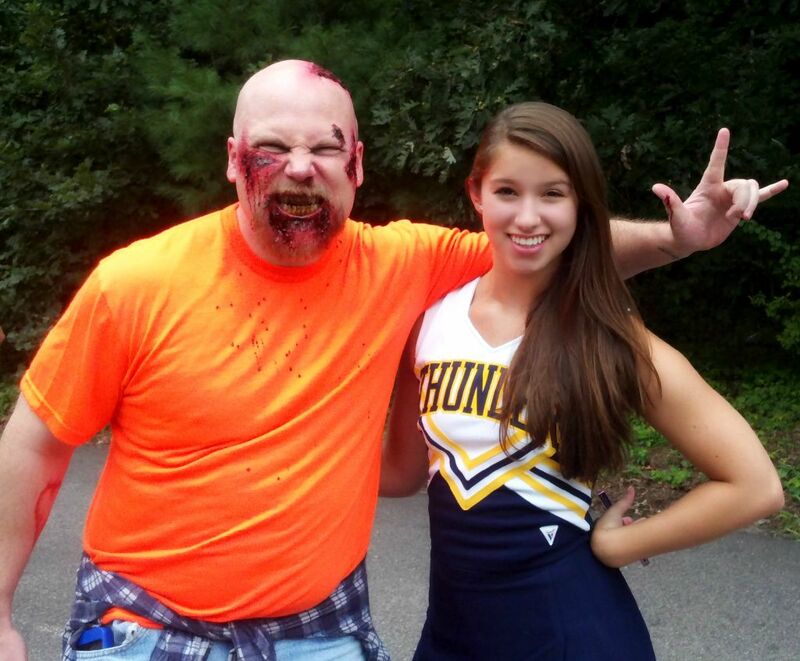 Not just any zombie, but a redneck zombie! What might that mean for a zombie? You'll have to wait a bit until this web series premieres later this fall to find out. Ever since I got into the Screen Actors Guild (SAG) in 2008, I've only gotten extra work, but on this project I'm a featured human once again. At least before becoming a zombie. Most actors rush to review a script for how many lines they have or try to figure out how much screen time they'll end up with. I prefer to see how much killin' I get to do or how grisly my death is. This project covers both criteria nicely. Zombies love making new friends. 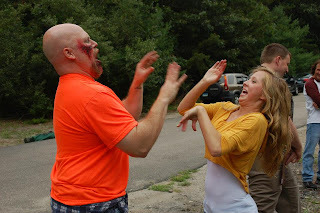 Last weekend was publicity day and most of the cast and crew got together for some video and stills mayhem. The real production will be in September and episode one should hit the web around Halloween. You can actually be a part of it by making contributions to the project. You can give as little as a dollar, but giving more will get you some goodies, all the way up to being an executive producer. How sweet is that? You can buy yourself a title, just like in Hollywood. So if you want to see me kill some cheerleaders, or if for some reason you want them to survive, consider a contribution. Check out the official site. You can also follow along on Facebook. Stand back. It's a slap fight! The CvsRZ cast and crew. 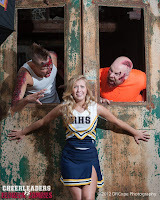 Part of the zombie horde. With Savannah Reinitzer and Mark Burzenski.